The German Special Civil Engineering Federation is an association of the leading German special civil engineering companies that operate domestically and abroad. • represents the interests of its members with regard to public and private clients, quality associations, interest groups, political organisations, technical regulatory organisations as well as the legislator. • supports its members concerning issues pertaining to specific technical construction contracts, certification and qualification, technical regulations as well as training, advanced training and further training in the field of civil engineering. 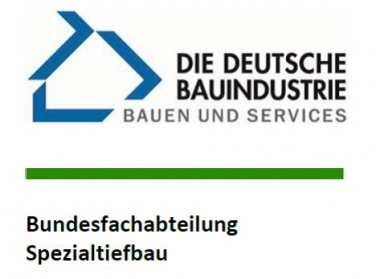 Approximately 40 companies of various sizes (annual turnover in Germany ranging from €1 million to in excess of €100 million) are members of the German Special Civil Engineering Federation. Based upon turnover, the German Special Civil Engineering Federation represents approximately 80% of the German special civil engineering market. A central issue at the German Special Civil Engineering Federation is the extremely sector-specific problem in dealing with “risks in the field of civil engineering”. This consists of contractual risks as well as the risks that occur on building sites, including a topic that continues to be extremely relevant in Germany, even today: Weapons from World War I and II. The German Special Civil Engineering Federation has compiled a leaflet concerning this issue. The leaflet content can be downloaded for free at www.kampfmittelportal.de. “Construction noise” is a further issue. Special civil engineering companies are increasingly experiencing problems with regard to this matter, especially when it comes to urban construction sites. The leaflet illustrates numerous methods to avoid construction noise-related problems at an early stage. The leaflet can be downloaded for free here. Occupational safety is an important and constant issue for the German Special Civil Engineering Federation. For the very first time, the German Special Civil Engineering Federation presented the “Safety Award” at its General Meeting that took place in Bielefeld, Germany in September 2016. The award honours special civil engineering companies for exceptional success in preventing industrial accidents on construction sites. One objective of the award is to place even more focus on occupational health and safety in the German Special Civil Engineering Federation member companies. A further objective of this prize is to allow the honoured companies to use the logo to demonstrate to third parties that this issue is of great importance within the company. Gold winners: Aarsleff Grundbau GmbH, Tiefbau GmbH Unterweser, Wayss & Freytag Spezialtiefbau GmbH; Silver winners: Keller Grundbau GmbH, Franki Grundbau GmbH & Co. KG, Implenia Spezialtiefbau GmbH; Bronze winner: Max Bögl Stiftung GmbH & Co. KG.